If you appreciate the farmland, for starters think about taking an actual field agritourism tour where more than 90% of North America's leafy green vegetables are grown between the months of November to March. Take one of their "Field to Feast" tours where you can harvest your fresh selection of veggies for a delicious lunch while there. Oh, before I forget... Consider attending Lettuce Days the second weekend of March... celebrity chefs, taste tasting events, exhibits and plenty more fun activities during this event right here in Yuma Arizona. If you like Medjool dates, be sure and pick up some gourmet Medjools while visiting as well as one of their famous date shakes! Explore the outdoors with some of the most rugged activities! With more than 80,000 acres of land just waiting for YOU to take advantage of in the area! Sand dunes: The Imperial Sand Dunes are just the kind of sandbox big kids love! Camping: Rugged mountains and stars.... need I say more? Boat Tours on the Colorado King: Relax and take in the world famous abundant sunshine! Rent a canoe or even a jet ski for those in need of a little more excitement! Need an Exciting History Activity? So What is the History of Yuma Arizona? 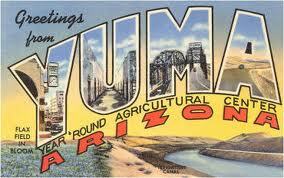 Well, it certainly dates back in time... Yuma welcomed its' first settlers with the Native American tribes. The descendants make up the Quechan and Cocopah reservations. Explorers Hernando de Alarcon and Melchior Diaz made their mark back in 1540 when they saw the potential that the area. They saw the potential that the Colorado River had for settlers and those passing through the area, such as military expeditions. From the 1850s up until the 1870s, the Yuma Crossing was known for its ferry crossing. Passengers and equipment depended on the crossing. It was the only means back then to travel up and down on the Colorado River. The military and various mines alike utilized the crossing. 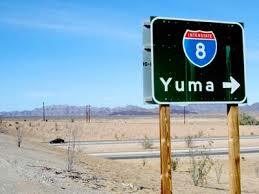 Today, Yuma Arizona is known for tourist attractions and easy access to both California and Mexico. You can easily access Mexico as it is a mere 10 miles away. If you are looking for warmer weather, Yuma offers that each and every year... Every winter, many people from the Midwest (and other areas too) travel to the area in search of the warm winter months. Arizona, known for its low humidity, except during our monsoon season when we get the majority of our yearly rain, the humidity levels are higher to afford the opportunity of the rains that are typical during this time. Monsoon season is from June 15th to September 30th. By early October the real intense heat finally lifts... that is not to say, however, that we do not have a few days that climb around the century mark. After living in Arizona for many years, I can say that after so many days hitting the 105/110 mark, having a 100 degree day actually feels pretty good! Yuma weather will easily have (on average) 175 days per year, having an average daily high temperature at about 90 degrees F, (32 °C), and sometimes higher. When talking about sunshine, Yuma leads the world in that category! Yuma is known as the sunniest place anywhere... which certainly explains why the armed forces train their pilots here. If you are looking for things to do in Yuma, there are plenty of things to keep you busy... if you are a history buff be sure and check out the Quartermaster Depot State Historic Park. This park is the site of an old Army supply depot which was in operation from the year 1864 to 1883. The depot stored six months' worth of supplies for all the forts in Arizona Territory, in addition to several forts outside of the territory. Get a close up look at the early Yuma years...covered wagons, steam engines, and plenty of history artifacts from the 1800's are sure to engage your interest.